NMIMS Registration 2019: Narsee Monjee Institute of Management Studies (NMIMS) offers admission to various undergraduate & integrated courses such as BTech, BDes, BSc (Finance), BCom (Hons. ), BBA, B.Sc. Economics, MBA Tech, MBA Pharma Tech based on entrance exam. NMIMS Programs after Twelfth (NPAT) is an entrance exam conducted by NMIMS annually in month of April. If you are interested to appear in this test, then apply for NMIMS NPAT Application Form. The form will be made available through online mode only. 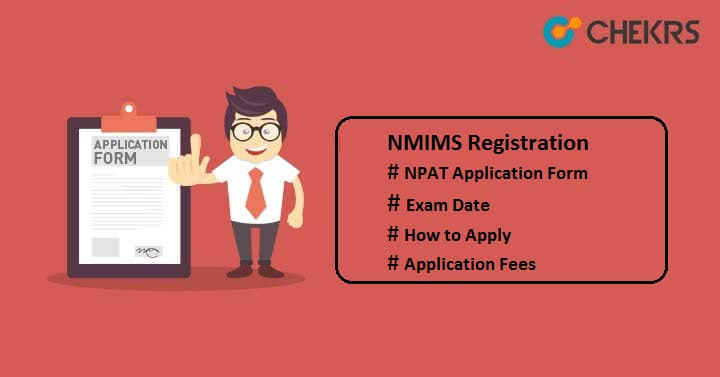 Read this article to get complete information related to NMIMS NPAT 2019, exam date, application form, How to Apply Online etc. NMIMS has not announced the official date yet. So take a look on expected NPAT Exam Date. Aspirants must check the NMIMS NPAT Eligibility before proceeding for the online registration. It is mandatory to meet the eligibility criteria in all aspects to be eligible to get admission in NMIMS. Maximum age should be 25 years at the time of registration. Must have passed intermediate or equivalent examination from any recognized central or state board. Minimum aggregate marks should be 50% in PCM subjects for Mumbai campus. For other campuses, only 45% aggregate marks will be required. Candidates who have secured at least 50% aggregate in Diploma in BTech degree are eligible for this exam. Students should have passed class 12th in respected streams. Candidates having minimum 50% in class 12 can apply for BCom whereas for BSc & BBA at least 60% aggregate marks are required. International Baccalaureate with mathematics or statistics degree holding candidates is eligible for BSc & BBA. Passed class 12th from any recognized central or state board with minimum 60% marks Or have IB Diploma degree. Aspirants must have degree in IB with passing certificate of class 12th or equivalent examination. 12th appearing students are also eligible to apply for NPAT Registration form. Candidates who are eligible for NPAT can check the step wise procedure to fill the NPAT Application Form. Click here to move to the NPAT Official page. Click on “Register” option available in “How to Apply” section. Enter the basic details like name, date of birth, valid mobile no & email id and submit it. After submitting the details, you will get verification link on your registered email id with NPAT/ Registration ID & Password. Go to your mail id to verify the link. Once complete the verification, proceed to the application page. Visit the official website again. Click on “Candidate Login” tab present on the home page. Fill the empty text field with proper details and then click on “Login” button. The application form page will appear on your screen. Submit the details and then proceed for the next step. Next step is to upload the scanned images such as photograph & signature as per the formats defined by the institutions. Images should be recent, clearly visible with white or light background. Now pay the application form as per your selection of programs. Select the payment type credit/ debit card, enter card details and then click on “Pay Now” button. At last click on “Submit” button for final submission. Take the print of filled in application form for further references use. Candidates whose applications are complete in all respects and submitted before due date, they can download their NMIMS NPAT Admit Card 2019. In case of any queries regarding NMIMS NPAT 2019, leave your message in the comment box below.